I’m just as guilty as you. By the end of the week, my fridge is a wasteland of body parts. A knob of onion here. Half a pepper there. Scraps of three different cheeses. A bit of broccoli not nearly enough for a decent side dish. And then a light went on. There IS something that brings all of those useless pieces together to create something delicious, and halfway deliberate. Quiche. Quiche doesn’t require whole anything. Just a few handfuls of this and that, glued together by milk, eggs and cream. The perfect way to use up the unwanted. 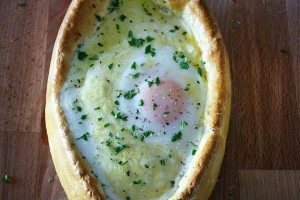 Here’s a guide to creating your own Kitchen Sink Quiche, made up of whatever you happen to have on hand. Big or small. Packed or sparse. 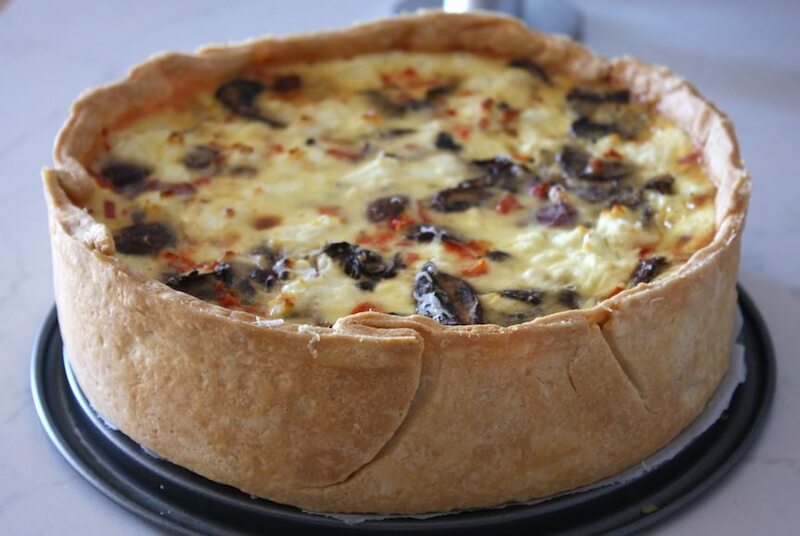 Quiche is made up of three parts: the crust, the custard and the fillings. Any buttery, flaky pie or pastry dough will do. I use the same pie dough as apple pie, since it doesn’t have any sugar in it. Just remember to roll it thick, no thinner than 1/2″. It will need to support the hefty filling. I also recommend pre-baking the crust. This will prevent a soggy bottom quiche, which is GROSS. 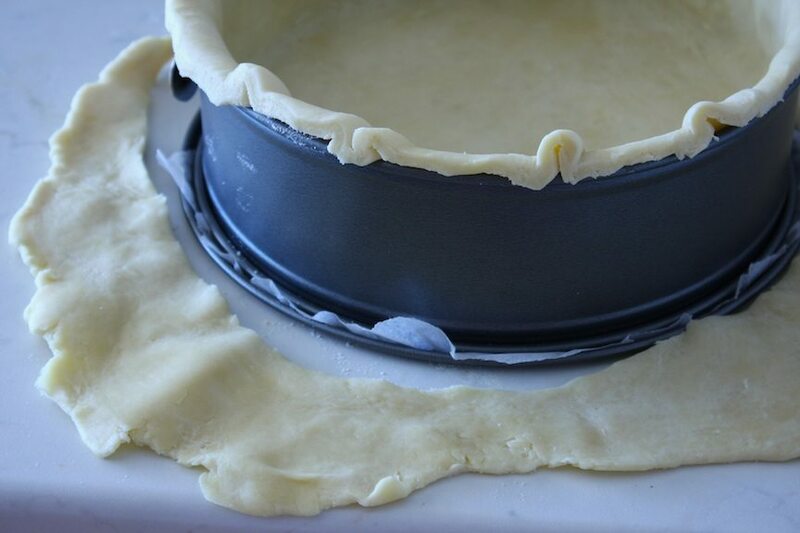 To do this, roll out your dough and shape it into your pie or springform pan. Line the dough with parchment paper. Fill the pie with rice or dry beans (nothing you plan on eating in the future). Put the pan in a 375F (190C) oven until the edges become golden and baked, about 20m. Remove the weights and parchment paper. Bake for another 7-8 minutes until the bottom is baked but not brown. Let cool. The custard is made up of milk, cream, eggs, salt and pepper. It all gets whisked (or blended) together until foamy. Depending on how much filling you have and the size of your pan, the amount of custard you need will vary. The custard proportions are: 1 cup cream, 1 cup milk with 3 eggs. That will fill a pie pan full of quiche. For a springform pan, I would double that. Reduce or increase as needed, just keep the same ratio and you’ll be set. Yuck yuck yuck. That was a little quiche humor. YOU’RE WELCOME. 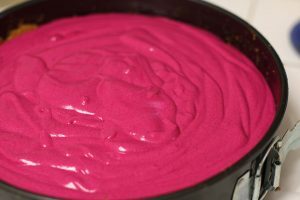 Hard Vegetables – Broccoli, carrots, cauliflower, asaparagus and the like will need to be pre-cooked. Cut them into chunks or florets, then blanch them in salted boiling water for about 3-5 minutes until slightly tender. Peppers and Onions – They can be added raw if you prefer for them to retain their crunchiness. If adding raw, dice them finely. Cheese – Any cheese works. Emmentaler and cheddar will give you the stringy and gooey effect. Parmesan is nice to grate on the top. Goat cheese and mozzarella work well too. Mushrooms – Mushrooms have a lot of natural liquid that is released when cooked. Best to saute them up in olive oil or butter before hand. Squash and Zucchini – Can be used either raw or precooked, chopped or grated. Tomatoes – Squeeze out the seeds and juice, then dice them up and add them to the filling. 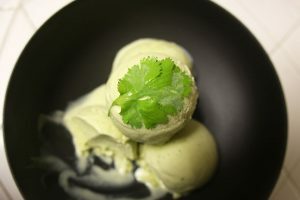 Herbs – Chop up herbs like mint, tarragon, thyme, parsley or rosemary and sprinkle them through the fillings. The sky is pretty much the limit. For my quiche, I used 1/2 head of broccoli (including the stem), finely diced 1/4 red bell pepper, 3/4 of 1 small red onion sliced paper thin and softened in olive oil, two handfuls cremini mushrooms sliced and sauteed with olive oil and sliced garlic, 2 spoonfuls of goat cheese, a small knob of mozzarella, and grated Grana Padano cheese on top. 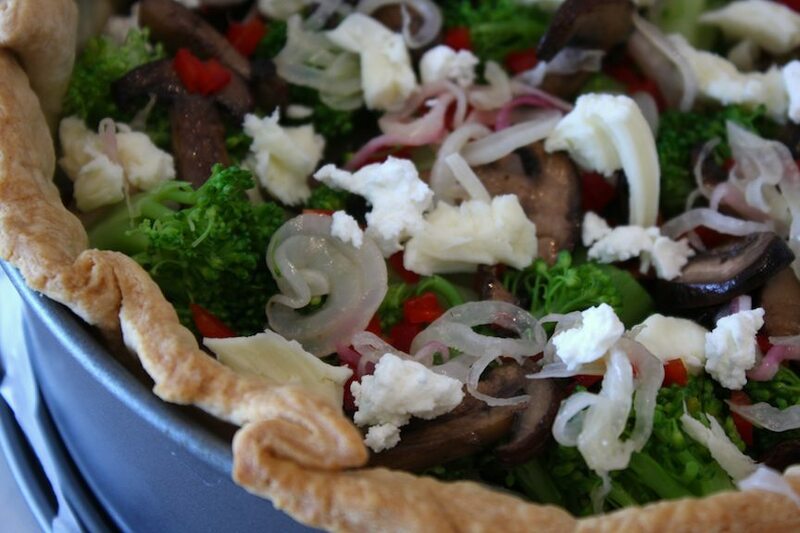 Preheat the oven to 325F (162C) Layer your toppings into the quiche until you reach about 1″ from the top. 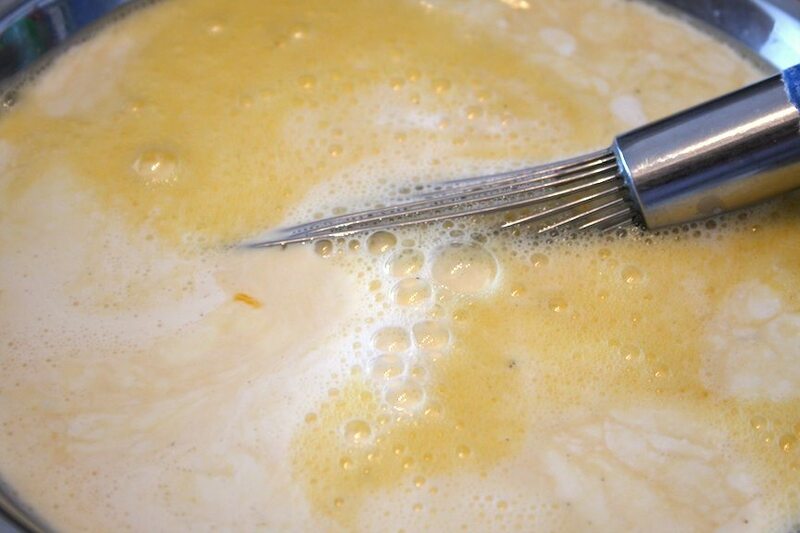 Using a ladle or measuring cup, slowly pour in the custard gradually until it reaches 1/2″ from the pastry rim. 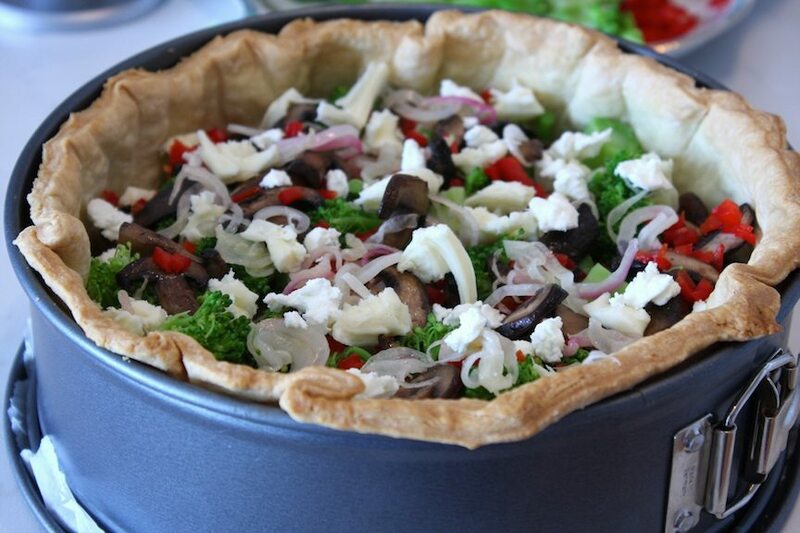 Bake the quiche for 45m to 1 hour for pie pans, 1 1/2 hours for a springform until it’s golden brown and set. Let cool for about 10-15m and unmold. Reheat quiche slices in a 350F oven for 10m.